This article is about time. Because you don’t have time, when you shoot street. In the following I will describe, how und with which settings I shoot my photos. Because I am using the Fuji-X-system the description is for this, but if you are using an other system, maybe you can ‘translate’ it for your device. My wife and I are owner of two Fuji-cameras: A X-T2 and a X-E3. 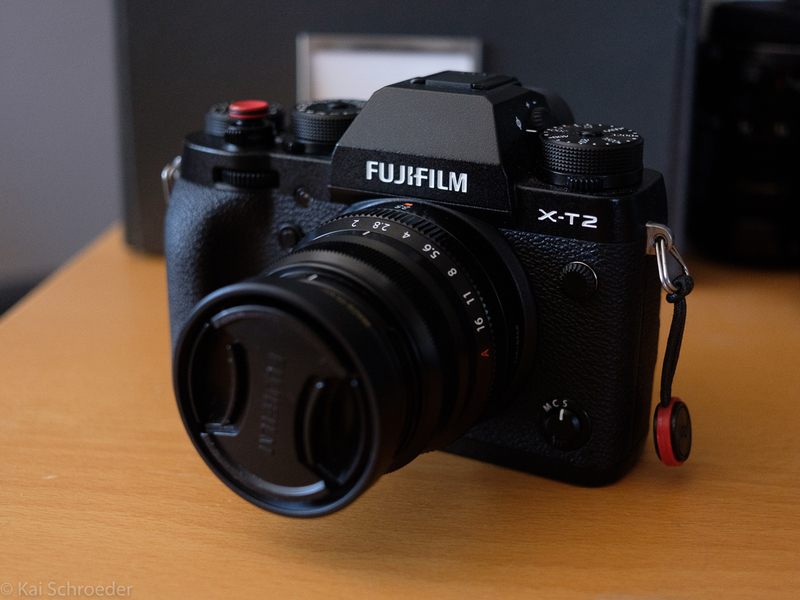 Most of my photos were taken with two lenses: The XF27/2.8 (Pancake) and the XF35/2. 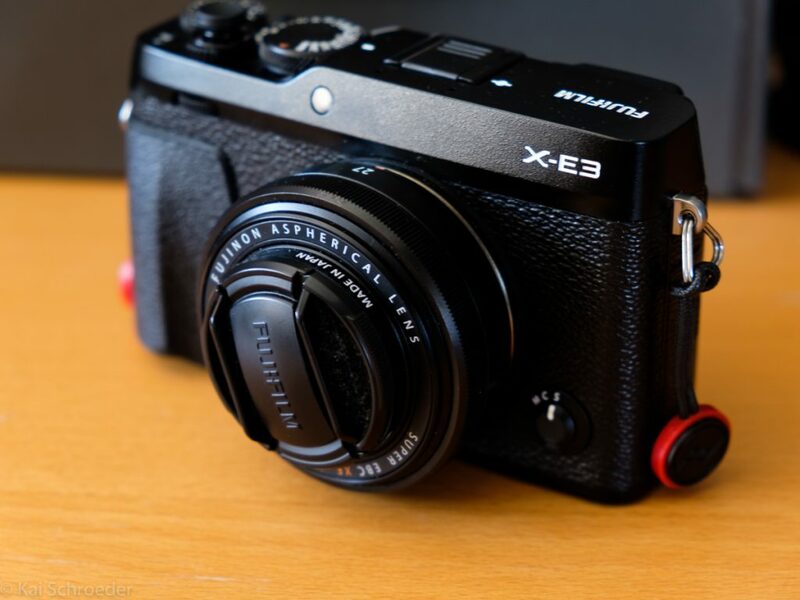 We have recently bought the XF23/1.4, which I use enhanced because of the extraordinary quality of the pictures. In very rare cases I use the XF56/1.2. As I mentioned before, I use enhanced the XF23/1.4 mainly in combination with the X-E3. In final analysis it is a trade-off between how big your camera should be and the picture quality. 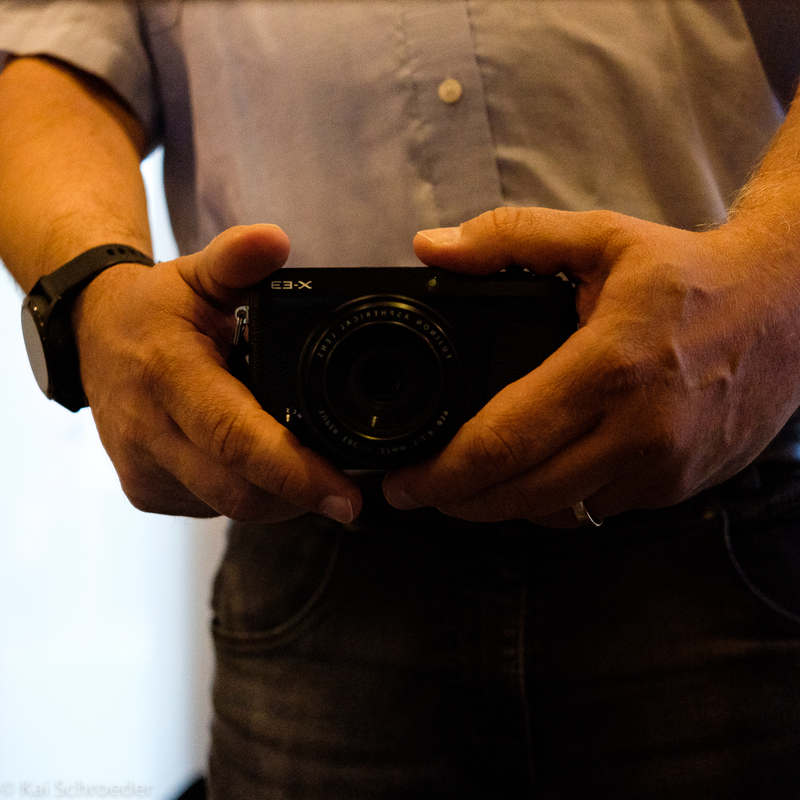 The X-E3 with the XF27/2.8 is my main gear, which I have alldays with me. 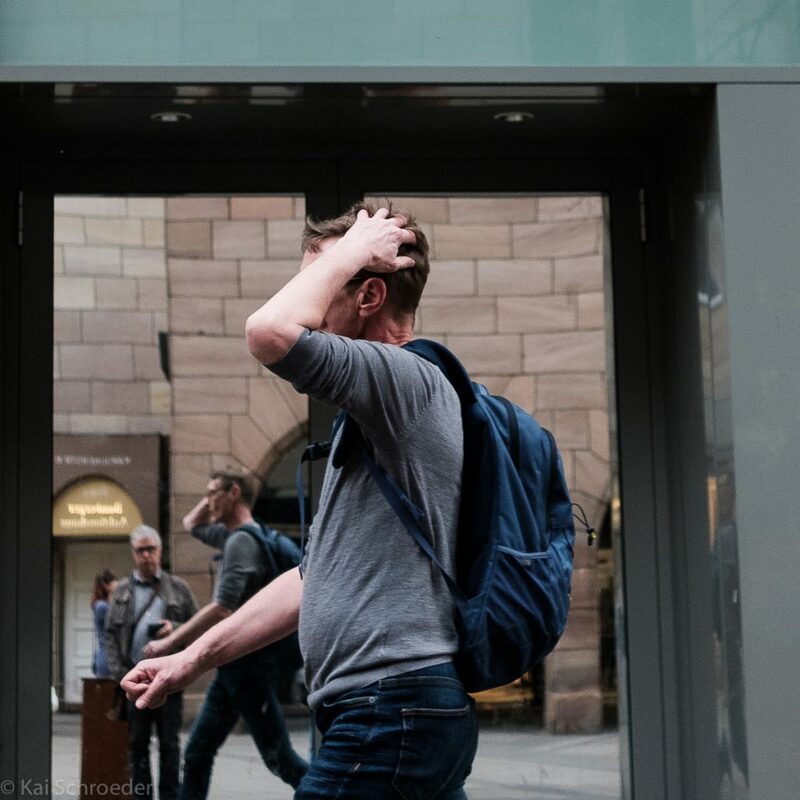 Because for streetphotography is the rule: The best camera is the one, you have with you. Approximately 90% of my photos were taken by a shoot from the hip and only about 10% with precise focusing. OK, I hear the ones right now, which say: ‘that is no real Streetphotography’. But shooting from the hip has two essential benefits: First most people don’t see your camera, when you hold the camera on the hip. But the most important cause is the velocity! It least to long, if you will raise your camera to your eye and do your precise adjustments. By the way ‘velocity’: My system is optimized for velocity. The fastest autofocus-settings (see below) and very fast shutter-speed. 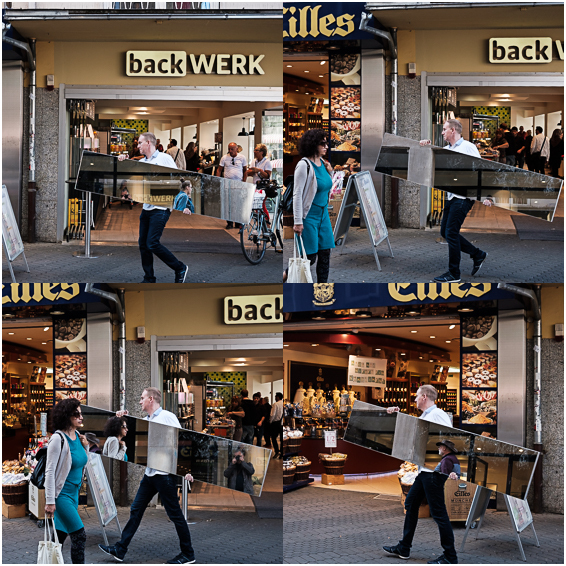 Because one is very important for Streetphotography: the decisive moment is very fast gone! You will never have enough time for doing your best photo. On the picture you can see the two-handed grip, but normally I use it one-handed. I have a soft-release-button on both cameras. That’s not because of being trendy, but as you can see on the picture, my thumb joint is lying on the soft-release-button. If I take a photo, I only have to give a litte bit of pressure on my thumb. How are my permanent settings on the cameras? Single-mode (S): Because the continous-autofocus is ‘pumping’ to much and that is slowing down. Series shooting with slow mode (CL) with 4.0 pictures per second: That’s because of in faster series modes there is too less change in the motif. Read also the description at the end. Area-autofocus with the tiniest area-field which is possible: I have read, that this mode is the fastest autofocus for Fuji-cameras. Also the possibility to get an autofocus point is very high. Electronic-shutter: because I don’t want to get heard. Please notice, that you have to be aware of the rolling-shutter-effect with this setting! no AF-assist-light: because I don’t want to be seen by others. At bright sun-light: Auto-ISO from 200 to 3200 and minimum shutter speed at 1/500 (because the possibility for shaking is very low). The shutter speed is on A and the aperture is varying in case of the motif. DR is on 100%. At normal light (standard-setting): Auto-ISO from 200 to 3200 and minimum shutter speed at 1/60, but DR is on 200% (if I need it, I choose an other DR-setting). The shutter speed is variable (mostly at 1/500) and the aperture is on A. Less light: Auto-ISO from 400 to 6400 and minimum shutter speed at 1/60, DR is always on 200%. The shutter speed is normally at 1/250 and the aperture is on A.
Additionally I have 3 presets on the Q-menu, which are fitting the three situations. Why do I take photos with a series mode? Beneath that there is one more advantage of the series mode: In some situations on the street there is a story in the sequence of photos. If you take more connected photos there is a comming theme. So, I hope, that I have provided some insights on my work. 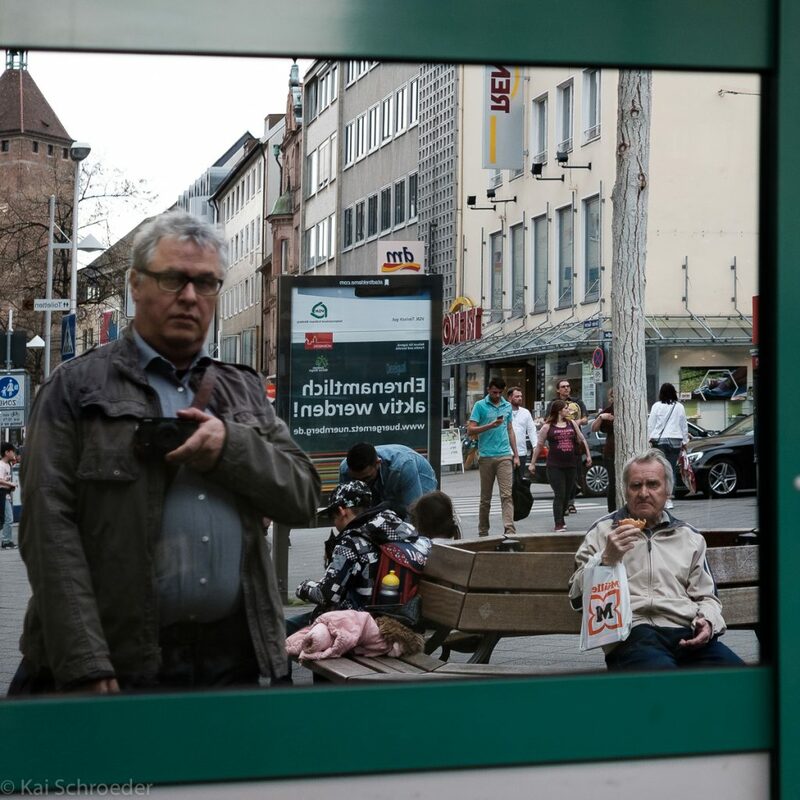 What does Streetphotography mean to me?